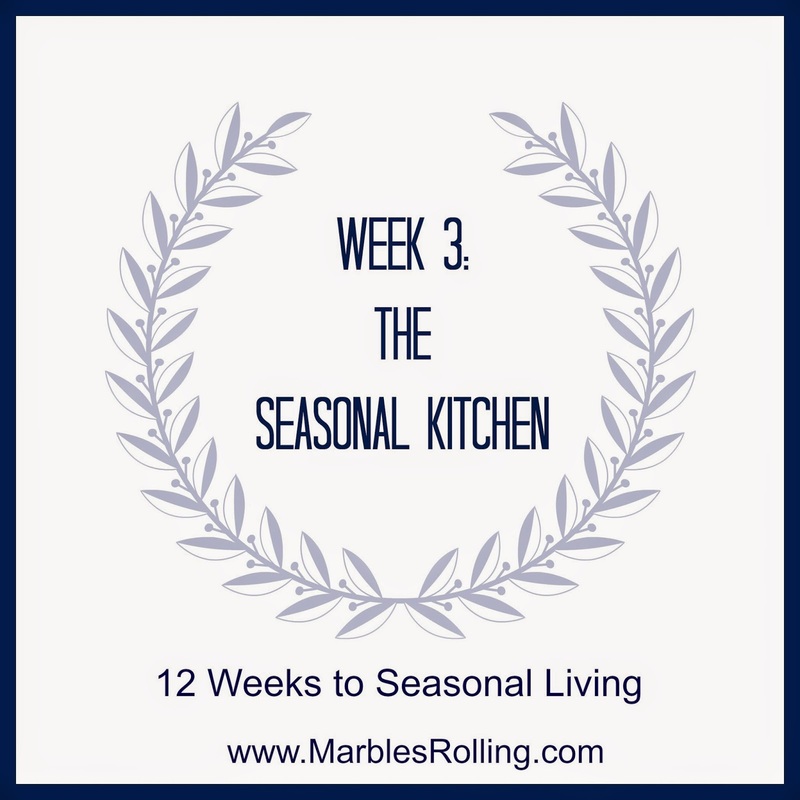 Week 3 of the HomeSpun Seasonal Living Workbook is all about the magic we make in the kitchen, and raises awareness for incorporating seasonal ingredients into our meals each week. Seasonal foods are local foods harvested in season. There are different definitions used to define the term “local,” and even the “seasonality” of foods can vary depending on where you live and how far from your home you are willing to source your food. Within 100 miles? Within the State? Within the Region? This week I revisited my own definition of locally sourced. I generally consider regional sourcing to be sufficient, where the bulk of our meat, vegetables, and fruit come from in and around the greater Richmond area, as well as anything else produced within the state, and sometimes including neighboring states like DC, MD, and North Carolina. So what is in season in Virginia this time of year? After sifting through a range of different sources I found these state specific seasonal produce guides to be the most helpful. 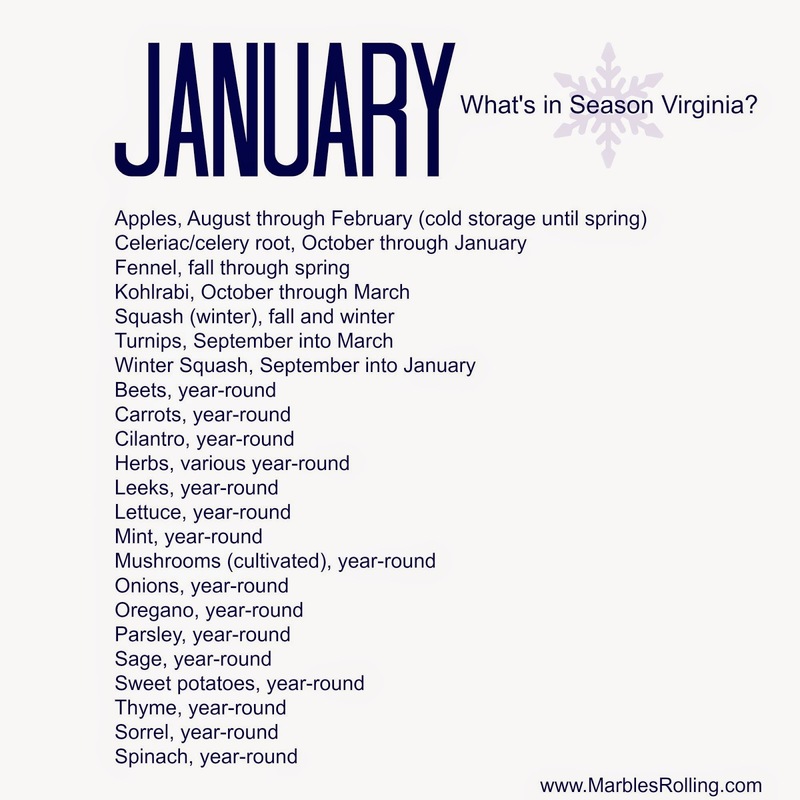 I was surprised by the variety considering Virginia has a pretty dormant Winter growing season. I reorganized the list by month so I could print out and easily reference what is in season when meal planning and shopping each week. Lately we've been shopping at Whole Foods, RelayFoods.com, and Elwood Thompson's, which specialize in doing the admittedly harder work of sourcing and labeling local seasonal foods for us. I based my shopping list last week off of the seasonal food list above, which simplified my options and streamlined my shopping experience. I made a hearty vichyssoise soup of leeks, onions, and potatoes; roasted and caramelized sweet potatoes; spinach salad with boiled eggs, apples, and chicken; roasted butternut squash and mushrooms with pork tenderloin; another smokey potato soup with carrots and fennel; and roasted beets with olive oil and sea salt. Plus whole grains, pastured meats, pears, and lots of citrus—cara cara oranges, satsumas, grapefruit, meyer lemons and limes. Our food was simple, and delicious, and vegetable centric. It truly felt like Winter in my kitchen. So what about citrus fruits that are technically at peak sweetness in Winter, and in season with the nation-wide harvest, but definitely not local to Virginia? I don't know. Right now we are devouring them. And what about eggs and chicken, and bacon? When we shopped at the Farmers Market almost exclusively we could not get eggs in the winter, or bacon whenever we wanted it, even chicken year round. There is a season for animals too and it has been largely lost or bypassed through technology and factory farming. These complicated issues make the challenges of eating seasonal fruits and vegetables seem easy in comparison. At localharvest.org you can look up local CSA’s, farmer’s markets, and farms by zip code. Find local farms at PickYourOwn.org. How did last week go, did journaling help connect you to the season? Share some of your captures of winter. I would love to go there with you. Out of curiosity, I just followed your link to see what is currently in season in Massachusetts....cultivated mushrooms and a few storage root vegtables. Such a sad list! But your menu sounds like it was delicious this past week! Hi Nicole, ugh garlic, onions, and mushrooms? Disappointing!! Sometimes I forget that Virginia is unique for it's growing season and fertile soil. Imagine if we lived in California, that would make seasonal/local second nature. I think January and February are the sparsest months here in VA. It probably doesn't get much better for you before March either I bet. Maybe you could broaden a local definition in the coldest months. Massachusetts has a short growing growing season, and such harsh winters, but I bet the summertime is lush. How much snow did you guys get with this last storm?